Quebec. While maple flavor can be enjoyed year-round, traditionally it’s a fall and winter flavor: We’re in prime maple season. 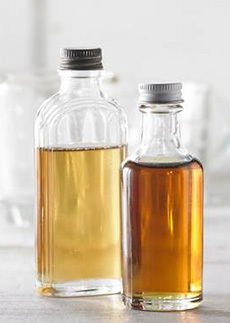 So here’s a lesson on the difference between real maple syrup (also called pure maple or 100% maple syrup) and maple flavoring from the Vermont Maple Sugar Maker’s Association. There are numerous grocery products promoting maple as an ingredient, from oatmeal and granola to yogurts and sausages. They display the word “maple” on their packaging and include images of maple syrup or maple leaves—even when the product contains not a single drop of maple syrup! That’s because the permitted labeling can be deceptive, starting with the number one use of maple, breakfast syrup. “Pancake syrup” and “maple-flavored syrup” don’t contain any maple syrup*. They’re corn syrup with artificial colors and flavors that emulate maple syrup. Maple syrup is a largely unrefined sweetener made from the sap of maple trees: simply sap that is boiled down. *Some products contain a small percentage of real maple syrup, 1% to 5%. This will be stated on the ingredients label. By the way, pure maple syrup has just 40 calories a tablespoon, compared to 50 for granulated sugar and 56 for corn syrup. If you’re confused about the meaning of the different grades of pure maple syrup, you’re no different from most people. Is Grade A better than Grade B? What about Light, Medium and Dark? The grading system for maple syrup is based on color, and was established by the USDA. Color is neither indicative of the quality nor the purity of the syrup, but it does indicate the strength of the maple flavor. Generally, the darker the color, the stronger the flavor—so the grade you like will depend on how mapley you like your syrup. And the color is based on the length of time the sap is boiled down. Thus, unlike in the U.S. school system, a grade of A isn’t better than a grade of B. With maple syrup, it’s a question of what you’re going to do with it. Grade A, which is made in Light, Medium and Dark, is for table syrup. Grade B is used largely in baking and cooking, and in cleansing diets. Grade A Dark Amber syrup, left and Grade B maple syrup. Photo courtesy Federation des Producteurs Acéricoles du Quebec. 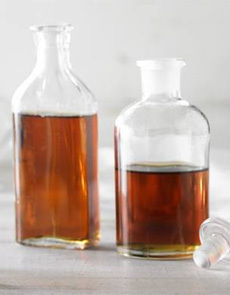 Grade A Light Amber Maple Syrup has a very delicate maple flavor, the lightest of all options. Grade A Medium Amber Maple Syrup is the most popular grade sold, but that doesn’t mean it’s the connoisseur’s choice. Stronger than Grade A Light Amber yet still mild in maple flavor, it’s closest in style to the artificial-flavored supermarket pancake syrup. Grade A Dark Amber Maple Syrup has hearty maple flavor, and is our choice for the best maple syrup for pancakes. Grade B Maple Syrup has much more robust maple flavor. Once reserved primarily for cooking and baking, it is growing more popular as a table syrup among those who relish the greater intensity. Commercial Grade maple syrup is not available for consumer sale. It has exceptionally strong in flavor and is used as a commercial ingredient. CHECK OUT ALL THE DIFFERENT TYPES OF SYRUP & SUGAR IN OUR TASTY GLOSSARY.